Razer doesn’t scrimp on the internal specs of its premium Razer Blade gaming laptops – but it still likes to keep them slick and thin rather than some of its rivals’ humongous fan-sporting competition. Extra space affords extra power, however, which is why Razer is introducing the Razer Core X, a plug-and-play external graphics card enclosure to boost the gaming potential of its laptop range. The Core X joins the existing Razer Core V2 in the company’s external GPU case range, but can be considered a stripped-down, bare-bones version focusing on graphics performance rather than the bells and whistles of the Core V2. So, where the Core V2 makes use of a slim form factor 500W power supply for 2.2-slot cards, and packs in USB, Ethernet ports and Chroma LED lighting for $499 (around £370 or AU$660), the Core X is a slightly bigger, no-frills enclosure for larger 3-slot cards, with an ATX 650W power supply priced at $299 (around £225, AU$400). The idea is that the added horsepower the Core X with dedicated full-sized GPU can bring removes the need for a full sized gaming desktop – your compatible computer manages as both, letting you have portable practicality and gaming grunt when you return home. A Thunderbolt 3 cable is then all you need to immediately get the two devices working together, with smart Razer software doing the hard work of making it truly plug-and-play. A relatively wide array of cards are compatible with the Core X too, from an Nvidia GeForce GTX 750 up to a GTX Titan X, to an Nvidia Quadro GP100 up to a Quadro P4000, and from an AMD Radeon R9 285 to a Vega RX 64. Whatever your preferred manufacturer, providing you have a relatively recent card you should be covered. Note of course that the GPU itself will have to be sourced separately. Razer would ideally love you to pair the Core X with one of its Blade, Blade Stealth, or Blade Pro laptops. However, you can pair the core with a Thunderbolt-enabled Mac running High Sierra 10.13.4 or above, depending on its own AMD graphics card being compatible. Likewise, Windows 10 users on other brands’ machines can pair up with the Core X provided their device has Thunderbolt 3 with external graphics support. Make sure to check the individual configuration of your machine is compatible before laying down the cash though. So, how easy is the thing to actually use? 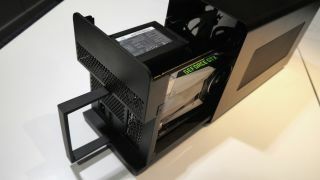 From our very brief hands-on time with the Core X, it seems very easy indeed – you simply pull on a locking lever which releases an internal chassis, pop your GPU of choice in and connect its power supply, slide the chassis back into the case, lock the lever and plug it into your computer. Everything feels satisfyingly solid, and relatively foolproof. At this stage, we’ve yet to see the Razer Core X hooked up to a gaming laptop to judge its performance, and just how seamless the system works in reality. But at a concept level, and given the known performance of earlier Core models, this looks like a relatively cost effective way to get some extra grunt into your lower-powered laptops. We’ll have more on the Core X once we’ve had some more extensive hands on time with it.